Last week, I shared a few thoughts on blogging and writing, and I’m hoping to turn it into a series as I ponder different blogging ideas. I finally went through my fall magazine collection and pulled out a few images to inspire me. It’s a fun, if tedious, process and I love having things to look at while I’m writing posts and searching for words. This season, I’m really drawn to dark florals, as well as simple silhouettes. I have no idea if those details will start to appear in my wardrobe, but I enjoy looking at the pictures while I’m working at my desk. You might have seen this recent New York Times article on blogging, as it’s currently making its way around the blogging world. I have definitely noticed a few blogs closing their doors (or laptops) recently, and with all good things, the end is inevitable. I mentioned this in my Alt for Everyone recap, but Kelly Beall of Design Crush talked about blogs evolving, rather than dying, so bloggers have to adapt, too. There definitely seems to be a shift in blogging these days, and bloggers are posting less frequently, just as readers are commenting less, too. It’s an interesting change to watch. And I was inspired by my Alt classes, so I made a few small changes over the weekend. I thought a lot about how I use Pinterest, which is only to share images I love and images from my blog. I switched to a business account, so easy for bloggers to do, and I also applied to use rich pins that provide more information than just the image and title. This will allow me to easily share my wordier blog posts and provide a bit of information below each image, too. The process was really simple and I followed this tutorial. I also read this post over the weekend and was struck by Natalie’s thoughts on writers being better at noticing beautiful things, rather than creating beautiful things themselves. This is something I’ve always struggled with, and it was wonderful to find it so well-written and explained. I’m curious about the rich pins! If I ever get on Pinterest on my actual computer I’ll take a look. 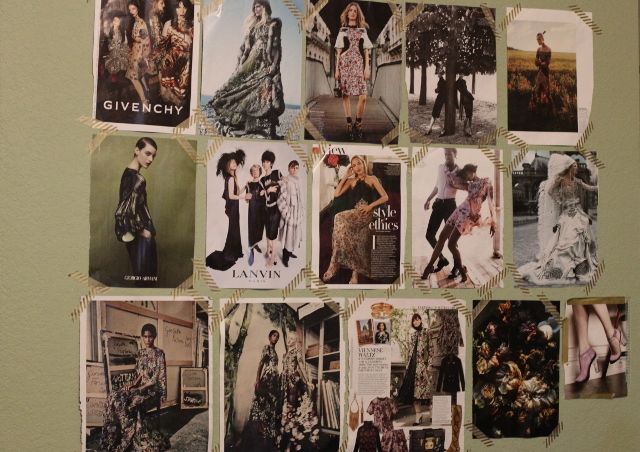 Your inspiration board looks perfect for fall. I always enjoy your posts; they’re so thoughtful. I’m spending a bit of time updating my journal-style blog (leahwise.com). It’s something that exists mostly for me and my family, but it has garnered a substantially larger following than my style blog, maybe because it’s not aiming for anything specific. I like the idea of noticing beautiful things; I’ve grown incredibly tired of the blogs that are so DIY heavy that they fail to be in conversation with other, potentially more talented bloggers, writers, and creators. Thank you so much, Leah. I’ve been really inspired by your style blog and have learned so much there. I’ll have to visit your journal blog soon, too. I’ve always thought I wasn’t crafty or good at DIYs, but I realize now that my writing is my craft.